For landscape valorization aimed on water retention needs ArcGIS Desktop Geographic Information System made by ESRI was used. Thematic maps (land use, hydrological and meteorological monitoring, soil water capacity and ground water resources) formed an input to the system. 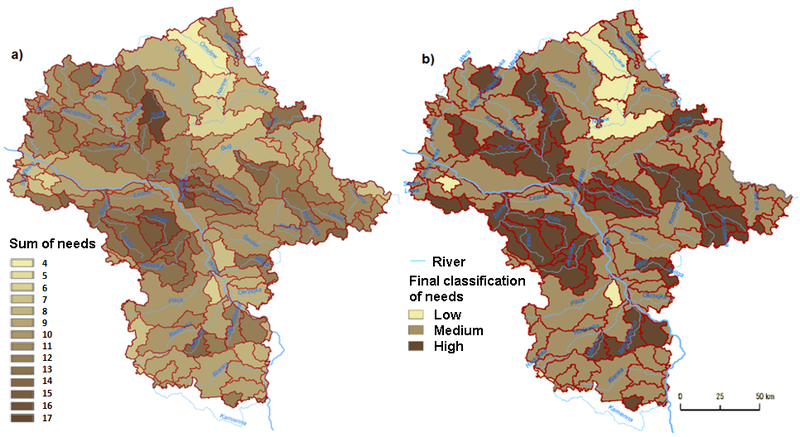 Geostatistical analyses were done as illustrated in Figure 1 and as a result three classes representing needs for water retention demand were identified. Finally the water retention measures proposed by stakeholders were evaluated. The analysis (case study) was done in Poland on the area of the mazowieckie voivodeship (35,579 km2). The proposed analysis was relevant to mitigation of droughts and floods. The other aim was to preserve the biodiversity of habitats that are strongly related to water resources, including habitats and species of a great natural value. Measures categorised as small retention aims to cause a slowdown of surface water runoff, rainwater outflow, and subsurface flow. While planning for undertaking such measures, measures aiming at retention of water within the catchment by increasing soil retention, use of aquatic ecosystems, old meanders and ponds should be prioritised. While developing a project, it is recommended to use natural conditions and features of the environment in a way that limits any potential negative impact. The use of natural conditions and features creates the best chances for success, and keeps costs to a minimum. As efficiency of this type of measures is strongly depended on numbers (many) and location (possibilities and needs), analytical tool for the feasibility study is much needed. Selection of Spatial Planning Unit (SPU) – in this case water bodies (as recommended by EU Water Framework Directive) were used. 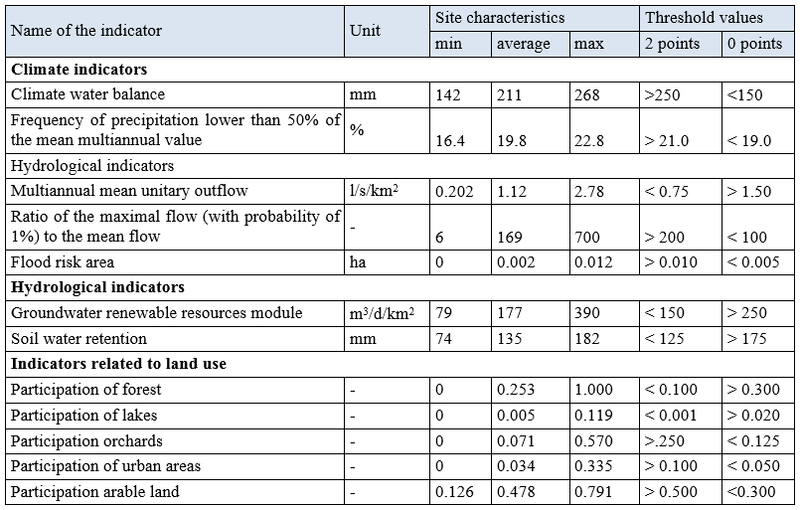 Selection of available indices characterising disposable water resources and retention capacity of SPU. Low – development of small retention is not needed. For example, the indicators listed in Table 1 were defined for the Mazovian Region in Poland, but similar calculations can be done for other regions. The aim of this analysis is to increase the flexibility of the spatial planning, defined by the area, not the precise location, and evaluate the investments in the light of environmental needs. In the first stage of the analysis, a water body was selected as a Spatial Planning Unit (SPU). Frequency of precipitation lower than 50% of the mean multiannual value. Soil water retention (for 1m layer depth and 2-4.2 pF). A map of the climatic indicators has been developed based on the interpolation of meteorological data that was obtained from the representative measuring sites (Figure 2a). 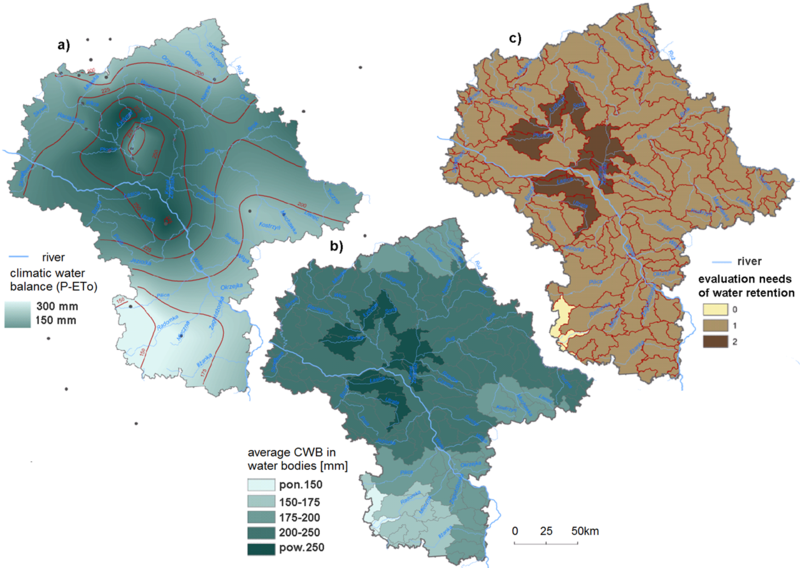 A map of the hydrologic indicators has been generated by connecting the multiannual statistical data on water flow from water gauges with the respective catchments. A map of the soil retention has been developed by the Polish Institute of Soil Science and Plant Cultivation. Finally, a map of the module of renewable groundwater resources has been obtained from Polish Geological Institute. No needs of small retention – water bodies with s sum of all points below 7. 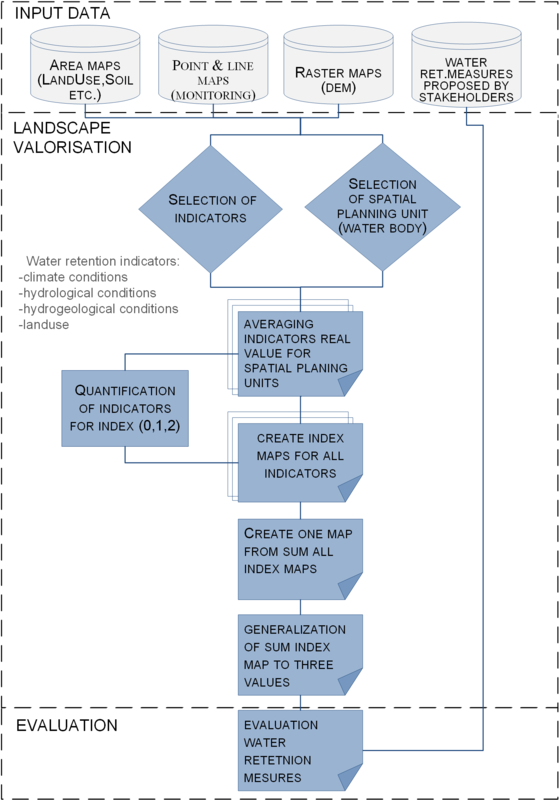 This valorization process can be used in any geographical areas depending on data availability and the only need is to develop region relevant quantification of indicators and threshold values. The technology aims on relation between the landscape (catchment) use and the needs for small water retention measures. It is an additional area of water management, which is not covered by the traditional planning of big controlling structures. It is a cheap solution for the sort of the feasibility study, however it is a data driven tool. Pusłowska-Tyszewska D., Kardel I., Tyszewski S., Okruszko T. and Chormański J. 2008. Substantial basis of the small water retention program in the Masovian Voivoidship (in Polish). Infrastruktura i ekologia terenów wiejskich. Kraków p. 71–84. Mioduszewski W., Okruszko T. 2015. Combining drought mitigation, flood protection, and biodiversity conservation. GUIDELINES. Manuscript of GWP.